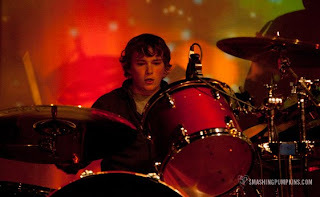 According to the official Smashing Pumpkins Web site, the band has selected a new drummer to replace Jimmy Chamberlin. Mike Byrne, a 19 year-old Portland, OR native will kick off his time in the Pumpkins by playing on the band's next album and tour, which are expected to be announced in September. After front man Billy Corgan (the only original member left in the band) called for drummers to audition last April and received over 1,000 submissions, Byrne was selected to meet with him in LA and offered the gig soon after. "We didn't actually play songs at the audition," said Byrne. "We just kind of jammed for about 15 minutes and then talked about Fugazi for the other 15 or so minutes." Prior to joining the Pumpkins, Byrne was involved in various Portland-based indie bands including Moses, Smell the Roses and the Mercury Tree. Long-time drummer Chamberlin quit the band this March, stating, "I will say, without going into any unnecessary details that this represents a positive move forward for me. I can no longer commit all of my energy into something that I don't fully possess. I won't pretend I'm into something I'm not. I won't do it to myself, you the fan, or my former partner. I can't just, 'Cash the check' so to speak."